Anytime sign can make any size and any shape LIDAR filters. These are 1" diameter LIDAR Filters with Best Quality 3M Adhesive. These 1" Lidar Filters UPC# 047393695437, have a .20" adhesive ring, making it 1.40" diameter overall, to adhere to sensors and lenses 1" or less diameter. 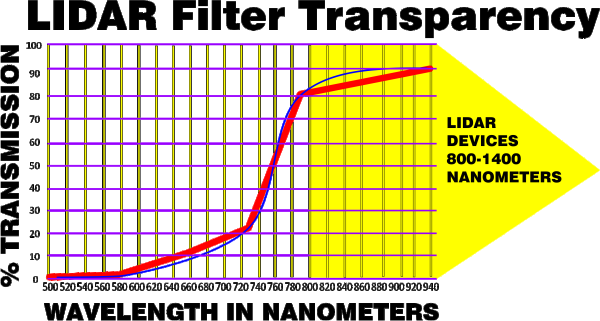 Lidar Filters are coated with Magic Black, which restrict non infrared light, making 800-1400 Nanometer devices more efficient by blocking non-infrared light. LIDAR Filters are constructed of 10 mil Polyester and 3M adhesive. LIDAR filters are used to enhance efficiency of distance finders, terrain finders, robot sensors, sensors for microtopography, mapping, viewshed analysis, solar energy analysis, glacier volume analysis and may be useful for gaming applications, BIM, Automatic vehicles, differential absorption analysis, doppler, ISMP and military applications. $3 each, with $3 First Class Mail shipping, additional items ship free. Call 1-800-582-1554 for quantity discounts or custom LIDAR Filter quotation.